This pesto pizza has only a handful of toppings, but don't underestimate the tastiness! 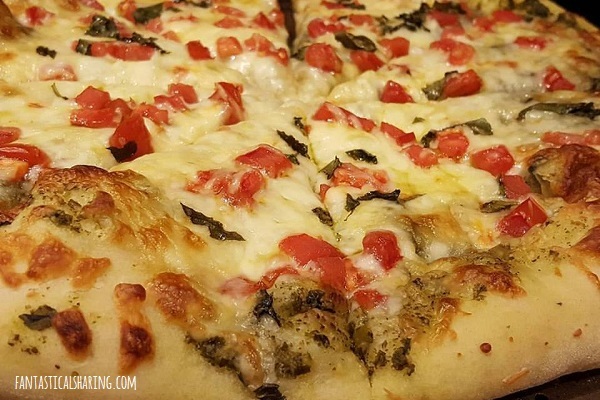 Spread pesto on pizza crust and top with mozzarella, tomatoes, basil, and Parmesan. Bake in a preheated 450 degree oven for 8 to 10 minutes or until cheese has melted and crust is golden brown. If you're a pestoaholic like me and you also enjoy zucchini, these Pesto Quinoa Zucchini Boats will make your day/evening! Or how about a little prosciutto with pesto, like in this recipe for Pesto Prosciutto Pizza from The Spiffy Cookie - it looks great!